Typical of the South, we have moved from summer to winter in a matter of 24 hours!! Why couldn't we have had this cool spell Christmas Day when we wanted it to be cold?! I'm going to be having a stern chat with Mother Nature about this crazy weather! 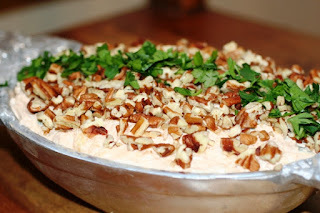 We visited with family in Alabama over the Christmas holiday and my sister made a wonderful dip that I wanted to share with you. Mix all ingredients well. You can form into a ball and roll in the pecans or mix the pecans in and serve the dip from a bowl surrounded by crackers. This little dish will be perfect for a New Year's Eve party appetizer. 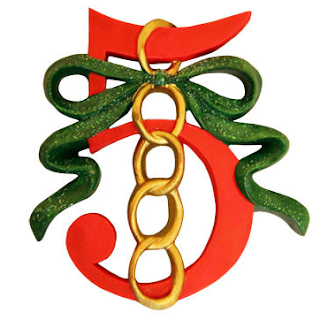 Today is the 5th Day of Christmas...5 Golden Rings! The five golden rings are said to represent the first five books of the Old Testament aka The Books of Law aka The Pentateuch aka The Books of Moses. These books describe the fall of man because of sin. They include: Genesis (Book of Beginnings), Exodus (Book of Redemption), Leviticus (Book of Holiness), Numbers (Wilderness Wanderings) and Deuteronomy (Reiteration and Reviewing). Tomorrow, we will be adding a few more birds! Oh JOY!! Same thing happened here. One day I was wearing shorts and had on the air conditioner. The next it was snowing. Crazy weather! Now we are low in the 20s...who knows what's next! That dip recipe sounds super yummy, Benita! Thank you…it was and was gone pretty quickly! You are so welcome! LOL...I'm trying to get it out of my head and was hoping this little series would help. I will have to dig up some videos to run on the blog...maybe the GoGo's or someone like that! :-) Love and hugs!! It was really good…give it a try when you get a chance! It truly didn’t last long at all! Honey, it’s messing with my sinuses also…the hubster and I are both miserable! We were in Alabama and every time we go back, our heads go crazy with all of the stuff growing down there! Yes, we were in Alabama for the holidays! I sure hope I saw you somewhere along the way...you should have kicked me! ;-) It is a good recipe and I like sharing good things with friends! Hugs!! I'm glad you're okay, my sweet friend. The weather just keeps getting worse and worse, I hear. You're one of the rare people that can teach me something about the past that I didn't know... love the 12 days of Christmas stream! It was so awful and I’m glad it is over…I hate when it gets so unstable. We weren’t home for the entire time and I honestly didn’t know if I would have a home to return to…I was glad when I pulled into the driveway yesterday and all was safe and sound. This dip sounds divine! And you're right...perfect for New Years Eve! PS years and years ago Martha Stewart did a segment on her tv show about the 12 days of Christmas. I printed it out but of course lost it. I'm so glad you are sharing this! I'm copying these so I'll have them. The song has such a beautiful history! The dip is really good so if you get a chance to make it, I hope you enjoy it! I'm glad you are enjoying the series and thank you so much! Hugs!! That dip really looks delicious. I wonder if you could substitute something red and colorful for the pimento? Maybe red pepper...although that would add a different taste...hmmmmm. And once again, I am learning so much through your 12 Days posts. Thanks! I think you could definitely do that...or add red/green peppers for even more of a festive look! Maybe even some jalapenos for a little heat! I'm so glad you are enjoying it! Thank you so much! Hugs!! The dip looks easy and yummy! Love your 12 days series too! Easy-peasy! Thank you so much! Glad you are enjoying it! Thank you ma’am…it was good! Hope you had a fabulous holiday!! Hugs! !